Our last two days in Ecuador were spent exploring Quito. In the evening we had a fun dinner listening to an enthusiastic pan flute band in a small local restaurant and pub. The band even invited us to sit in on a few songs! Okay, not really, but we sure look like we know what we're doing. The next morning our local tour guide started our tour off with a drive up the ever present hill just south of old town called El Panecillo to see the amazing view overlooking Quito and the huge landmark statue of the Virgin of Quito. Of course, no tour of Quito is complete without visiting a few of the stunning churches in the old town. We climbed to the top of the clock tower in the Basilica del Voto Nacional, a massive Gothic Church just north of the old town, and also visited the ornate gold leaf domes of the Compania de Jesus, one of the most beautiful churches in the world. Quito has several interesting squares where daily life is full of activity. Once again the rain came so we ducked into a resturant and had a fun lunch with several pitchers of Sangria that made the afternoon tour a bit more informal and full of laughter. Soon we headed back to our hotel to finish packing for our late evening flights home. After a final celebratory dinner we headed to the airport and said our goodbyes to Edgar and our driver Luis. Everyone is ready to get home to our loved ones but already dreaming about our next adventure. Thanks for following along. We have been exploring all that charming Banos has to offer. Yesterday we all had a soak in the local hot volcanic thermal baths. Here's the best way to describe our experience. New bathing cap, $1.00, entry fee $2.00, new swim suit $8.00. Embracing all things funky, priceless. 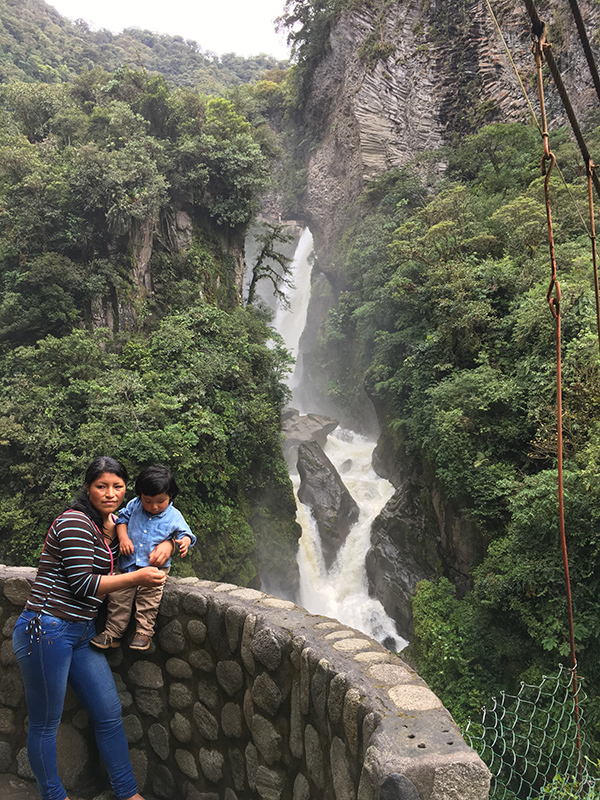 After the bath we headed south to see the famous Pailon del Diablo (Devils Cauldron) waterfall. It's quite the hike down to the waterfall and once at the bottom you must crawl on your hands and knees through a small cave like rock tunnel to go behind this massive waterfall. It's a spectacular example of the power of nature. Later some of us had massages and also did some shopping. We've enjoyed the good food and fun nightlife of Banos. Today we're heading back to Quito. On the way we are planning to see a few more unique sites. Especially a town called Pelileo that's known as the "blue city" because it's the blue jeans capital of Ecuador. The plan is for everyone to get a new pair of blue jeans to show off in Quito. There's also talk of stopping in another town known for the delicacy Cuy to give it a try. Okay, we're off to Quito now. Stay tuned, we may post pictures wearing our new jeans! It's been said that perfect weather makes mountaineering look easy, but mountaineering in rough weather is what separates the novices from the hardy. We have done extremely well these past six climbs to persevere in wet cold conditions that tested our spirits and resolve and yet we continued to make the best of whatever weather was thrown at us and we climbed steadily upward. Today we tried to climb the highest mountain in Ecuador, but the summit was not to be. After ten days of climbing in adverse conditions this morning on Chimborazo we had a wonderfully brief moment that reminded us just how beautiful mountains can be. It was short lived and soon we retreated with our pride intact. We did our best and the mountain will always be there for another try. It was great to climb again with my old friend Edgar. He is undoubtedly the best mountaineer in Ecuador and he always makes everything run smoothly. We're wishing him luck on his IFMGA exam next month. We have to also thank Flavio, another outstanding strong mountaineer, and our driver Luis for their support. The adventure is far from over. We're in Banos now enjoying much better weather and the charms of this unique city. We'll be here a few nights before heading back to old town Quito for a night before heading home. The two pictures on this dispatch symbolizes this trip well because we have smiles on our faces. After a relaxing rest day eating fantastic Italian food and sipping on whiskey we are heading to climb Chimborazo in the morning. We briefly saw this bright warm thing in the sky and have been debating what it could be. Someone suggested it was the sun, but we're not certain we believe it yet. Despite the rainy weather team Ecuador continues to keep our adventurous spirits up with mucho doses of laughter. Wishing everyone back home a good weekend. We're back in civilization again after several days living above 15,000 feet. We had a successful summit of Iliniza Norte in cold wet weather. After another night in Nuevos Horizontes Hut the team got up at one am for an alpine start on Iliniza Sur. It had snowed all night and after a couple hours of climbing the team reached a long exposed vertical snow ramp that looked suspiciously avalanche prone. After testing the snow it was very clear it was time to turn around. The team made it back down to the hut and had an amazing breakfast cooked by the hut caretaker and park ranger Freddy. We all packed up and started our three hour hike down in blowing snow. Once back in the town of Machachi we treated ourselves to steaks and several cervezas. Okay, I had veggies and rice, but did take a bite of Randy's steak Diablo. Today is a rest day and tomorrow the plan is to head south to climb Chimborazo, but given the weather even the best laid plans can change. Everyone is missing family and friends back home. Last night we had the hotel to ourselves and were treated to another delicious meal. The soup was especially great! After dinner out host, Rocio performed a traditional Ecuadorian dance. After which, exhausted, the team retired early for the evening to recover from the days climb and prepare for the next day. We woke early, had a quick breakfast, and headed out for the day’s climb up Mt. Corazon at 15,678. Today we drove Edgar’s four wheel drive truck up to the start of the climb. Due to the very heavy rainfall of the last few days, and particularly last night, the roads were terrible. We stopped short of the designated parking area and just left the truck on the side of the road. The weather was perfect climbing most of the day and we saw great vistas. As we approached the summit the weather started moving in and we put on rain gear as well as climbing harnesses and helmets. We went on a bit further, the rain picked up and then snow and we became conscious of the clock and the need to get back to the car before dark. We headed down at a good clip and made it back to our Inn for beers and telling stories about the day. Tomorrow we head up to a hut from which we will do our next two climbs: Illiniza Norte and Illiniza Sur. It may be a couple days before our next dispatch. Yesterday, after a late start due to our 3 am arrival the night before (actually morning of), we took the TeleferiQo Gondola in Quito to the side of Pichincha Volcano to lookout Cruz Loma. We then visited the Mitad del Mundo, a museum at the equator or the “middle of the world”. We then drove from Quito to Machachi on the Pan American Highway. We had a lovely meal and spent the night at a wonderful small, family owned hotel. We woke early the next morning, ate a quick breakfast and headed out for our hike up Mt. Pasochoa. We drove part way up, parked at an illicit bull fighting ring(! ), and then started our hike. It was not an easy hike, minimal trail and rain most of the day. The herd of bulls were blocking the trail at one point and Lars’ rescue whistle saved us all. We made it very close to the summit before we decided to take the photo and head back as conditions were very wet and slippery on the rocks and we didn’t want to lose anyone on our first real climb!. We are all having a great time and laughing lots which is helping keep our spirts up in the rain. Worldwide Adventure Guides is off to Ecuador. Ecuador is located on the Equator in South America. We will be climbing a total of six peaks including the highest peak in Ecuador called Chimborazo at 20,702 feet. We have a great group of climbers and everyone is excited to get started. We fly into Quito, and since Quito is at 9184 feet we plan to take an easy day to adjust to the altitude. Our acclimatization schedule has us climbing higher each day and returning to a lower elevation each evening to sleep. This schedule will help maximize our ability to adjust to the higher altitudes. Day one will be a slow and easy hike up the Teleferiqo at 13,000 feet. On Day two we continue our acclimatization process and climb Mt. Pasochoa at 13,778 feet. The following day we'll climb Mt. Corazon at 15,702 feet. After another good night’s rest at a lower elevation, we’re off to establish a higher camp at the Nuevos Horizontes Hut (15,702) for two nights. We’ll climb Illiniza Norte at 16,818 feet and return to the hut and the next day to climb Illiniza Sur at 17,267 feet. After a full day and night of rest we’ll climb to the Whymper Refuge Hut (16,400) to sleep. Our final goal early the next day is to climb Chimborazo at 20,702 feet, the highest mountain in Ecuador. We hope to be able to send dispatches every day, but it will depend on satellite and internet connections, so please remember that if we don't update dispatches for a day or two it's not an indication of problems. Please follow along with Randy, Lars, Ron, and myself on our Ecuador climbing adventure. More Ecuador dispatches to come!